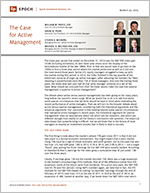 The Case for Active Management - Epoch Investment Partners, Inc. The three-year period that ended on December 31, 2014 saw the S&P 500 Index gain 74.6% (including dividends), its best three-year return since the heyday of the tech/telecom bubble of the late 1990s. Prior to that you would have to go back to the 1950s to find a three-year period where the market performed as well as it did over the most recent three years. Active U.S. equity managers struggled to keep up with the market during this period. In 2014, the Index finished in the top quartile of the eVestment universe of large cap active managers (after adjusting the numbers for fees), meaning it outperformed more than 75% of those managers. And over the trailing three years, the Index beat well over half of that same manager universe on a net of fee basis. What should we conclude from this? Do these results make the case that passive management is superior to active management? The debate about active versus passive management has been going on for many years, long before the market’s recent surge. What we would like to do is to talk first about some special circumstances that we think should be kept in mind when evaluating the recent performance of active managers. Then we will turn to the broader debate about active versus passive management, considering both the theoretical arguments and the empirical arguments. Our conclusion is that looking beyond some special circumstances that hampered active managers in recent years, the theoretical argument for passive management relies on assumptions about risk which are too simplistic, and which are different enough from reality to call the theory’s conclusions into question. The empirical data shows that outperforming is difficult, but we attribute that to the failure of most managers to employ an investment process that is likely to lead to success. The first thing to note about the market’s almost 75% gain since 2011 is that it did not take place in a normal economic environment. You might expect that a stock market rising 75% must be a sign of robust economic and profit growth, but in this case that was not true. U.S. real GDP grew 1.6% in 2012, 3.1% in 2013, and 2.4% in 2014 — not a single “boom” year among the three. Earnings for the S&P 500 were equally modest. According to Standard & Poor’s, earnings for the index grew a cumulative total of just under 15% over the three years. Clearly, if earnings grew 15% but the market returned 75%, there was a huge expansion in the market’s price/earnings (P/E) multiple. (Not all of the difference comes from P/E expansion; some of the return came from dividends. On a price-only basis, the S&P 500 rose 63.7% over this period.) Using S&P’s numbers again, we note that in fact, the P/E multiple for the S&P 500 (based on trailing “as reported” earnings through the end of February of 2015) rose from 14.5 at the end of 2011 to 20.0 at the end of 2014, an expansion of 38%. Looked at another way, if we break down the S&P 500’s total return into its three components — earnings growth, P/E expansion, and dividends — and scale them so they add up to 100%, P/E expansion accounted for 51% of the Index’s total return. This phenomenon was not limited to the U.S.; in fact, it was more pronounced in international markets. The MSCI World Index returned 56.6% for the three years ending 12/31/14, and MSCI data shows the P/E ratio for the Index expanding by 37% during that time, meaning that P/E expansion accounted for 65% of the total return. What accounted for this P/E expansion? The answer is simple: quantitative easing (QE). The Federal Reserve initiated its third round of unconventional monetary policy in September of 2012, buying $85 billion per month in Agency and Treasury debt, only ending the policy in late 2014. In the parlance of the markets, this created a “risk on” environment, in which traders bought any and all “risk assets” they could get their hands on, regardless of the fundamental attractiveness of those assets. Perhaps the best way to illustrate this is to look at the performance of stocks with negative earnings versus the performance of stocks with positive earnings. We went back and divided the stocks in the S&P 500 into two baskets at the end of every month: those whose trailing twelve-month earnings were positive, and those whose earnings were negative. Then we looked at how the two baskets performed over time. Normally, you would expect stocks with negative earnings to underperform stocks with positive earnings. And over the long term, that is what we observed. We went back to the end of 2002 for this analysis (based on data availability), and found that cumulatively, stocks with positive earnings rose 202.9% over the twelve years through the end of 2014, while stocks with negative earnings fell 20.7%. But for much of the last three years, stocks with negative earnings actually did quite well — at times, considerably better than stocks with positive earnings. From the end of 2011 through August 2014, stocks with negative earnings gained 94.9%, while stocks with positive earnings rose 68.0%. Only in the last 4 months of 2014, as QE3 came to an end, did stocks with negative earnings start to revert to form. In those last four months of last year, they fell 11.7%, while stocks with positive earnings rose 3.9%. An analysis of the performance of the MSCI US Quality Index over a longer time frame gives a similar picture. The Quality Index consists of 125 stocks that rank highest on a quality scale based on three factors: high return on equity, stable year-over-year earnings growth, and low financial leverage. We have history on this Index going back almost 40 years, to the end of 1975. From 12/31/75 to 12/31/14, a period of 39 years, the MSCI US Quality Index compounded at a 12.4% rate, while the overall MSCI US Index compounded at 11.5%. In other words, high-quality stocks outperformed the broader market by 0.9% per year over a 39 year period. But when we look at how the Quality Index did over the last three years, we note that it lagged the broad market: for the three years through 12/31/14, the Quality Index gained 66.7%, while the overall MSCI US Index gained 74.6% (identical to the S&P 500). Most active managers, though not all, tend to avoid stocks with very poor fundamentals, and focus instead on higher-quality companies. The long-term performance figures that we cited a moment ago indicate that this is a sensible decision, for higher-quality stocks have outperformed the market over the long term. But in the “risk on” environment that QE created, lower-quality stocks managed to outpace better-quality stocks for three years. Now add in a second factor. Typically, active managers keep 2% to 3% of a portfolio in cash, in order to be able to initiate new positions as opportunities present themselves without necessarily having to sell an existing holding at the same time. In the case of mutual funds, managers need to be prepared to meet redemptions immediately, and having some cash on hand enables them to do whatever selling they are going to do in an unhurried (and hence more cost effective) fashion. On average, holding cash will create a drag on performance, because cash has a lower expected return than stocks. The extent of the drag will vary depending on the yield available on cash. Over the long term (i.e., going back to 1928), stocks have generated annualized returns of about 9.6%, while three-month Treasury bills (which are a good guide to what you can earn on cash) have had annualized returns of 3.5%. That’s a gap of 6.1%, so a 3% position in cash, over the long run, would have cost you about 18 basis points (i.e., 0.18%) per year in underperformance, or about 0.55% over three years. Combine the abnormally poor performance of quality stocks with the abnormally large cash drag over the last few years, and it is not surprising that active managers lagged the market during this period. The case against active investment management predates the unusual environment of the last three years, though. That case rests on two seemingly impregnable pillars, one theoretical and one empirical. On the theoretical side, Modern Portfolio Theory and its offshoots, the Capital Asset Pricing Model and the Efficient Markets Hypothesis, all of which have won Nobel prizes for their creators, argue that the optimal strategy for every investor is to simply buy and hold the market portfolio (i.e., an index fund), and that trying to outperform that portfolio is futile because market prices at any point in time fully reflect all publicly known information. (Going forward, we will use “MPT” generically to refer to the broad body of theory.) On the empirical side, evidence over several decades indicates that the average active manager underperforms the market by roughly the amount of the manager’s fees and transactions costs. These are powerful arguments, and we don’t mean in any way to be dismissive of them. But they are not as conclusive as their proponents believe. On the theoretical side, we would like to discuss some reasons to doubt that modern portfolio theory is a sufficiently accurate model of the way the world works. In the last two decades, a new generation of “behavioral economists,” who combine insights into human psychology with the study of economics, has cast doubts on some of the assumptions that lie behind MPT, to the point that one can have reasonable doubts as to whether a passive strategy is really the theoretically optimal strategy. (Behavioral economics has won its own Nobel Prize, too.) And on the empirical side, we would like to talk about what the performance history of active managers does and does not tell us about whether active management can generate excess returns. In this chart, return is on the y-axis and risk, defined as the volatility of returns, is on the x-axis. The blue line is the Efficient Frontier, representing the portfolios that have the highest expected return that you can obtain for each level of risk by combining risky assets (like stocks). The red dot on the y-axis represents the return of the risk-free asset (such as short term Treasury bills). The Capital Market Line starts at the risk-free asset and is drawn so as to be tangent to the efficient frontier. The portfolio at the point of tangency, which we will call M, is the portfolio that enables investors to achieve the most efficient combinations of risk and return when it is combined with the risk-free asset. (The Capital Market Line represents those combinations of risk and return.) Meanwhile, every investor has a set of indifference curves that connect the various combinations of risk and return that have the same utility to that investor. These curves are assumed to curve upward as the level of risk rises (i.e., you need to be paid a higher return to make you indifferent to the higher risk). These curves nestle one on top of another, with each one representing more utility than the one below it. In the chart, we show one indifference curve for each of two different investors — these are the highest curves (i.e., most utility) for those investors that are tangent to the Capital Market Line. The points of tangency, marked as A and B, represent the mixes of cash and portfolio M that each investor would hold in order to maximize his or her utility. So what does portfolio M consist of? This is where the intuitive appeal of MPT comes in, for it presents an elegant logical argument: if there is a portfolio that is optimal for everyone, then everyone would hold that same portfolio; but if everyone holds the same portfolio, then everyone’s portfolio is just a miniature replica of the aggregate total portfolio, which by definition is the market. So portfolio M is the market portfolio, which in practical terms can be accessed through a passively managed index fund. To reach this conclusion, though, MPT, like much of classical economics, is based on certain assumptions about how people behave. (That last sentence is somewhat ironic, because when Harry Markowitz first formulated the original portion of MPT for his doctoral dissertation at the University of Chicago in the early 1950s, Milton Friedman argued that what he was doing was not “economics.”) MPT assumes that investors evaluate potential investments in two dimensions: expected return and expected risk. It further assumes that investors seek to maximize their expected return for any given level of risk. This all seems perfectly sensible. But the first problem lies in how MPT defines risk. (We’ll come back to the idea of “maximizing return” a little later.) As mentioned above, MPT assumes that investors use volatility of returns as their sole measure of risk. That means that any two investors can agree on the riskiness of a particular investment, or for that matter the riskiness of a portfolio. But using standard deviation alone as our only measure of risk ignores the impact of a phenomenon known as “loss aversion.” This means more than just the fact that people don’t like to lose money. Specifically, it means that people’s attitudes towards gains and losses are asymmetric. The pleasure of gaining 10% is more than offset by the pain of losing 10%. There is nothing “irrational” about this. In fact, it has to be this way, if you think about it, because losses can only go to 100%, while gains can go above 100%. The opposite utility equivalent of a 110% gain can’t be a 110% loss, so the relationship has to be asymmetric. The real point we’re trying to make is that simple volatility of returns is a poor measure of how investors actually perceive risk, because of the asymmetry between how gains and losses are experienced. But that means that the standard two-dimensional picture of risk versus return that we started with is simply not an accurate depiction of the real world. Risk can not be captured in one dimension. We would need to add one or maybe even more dimensions to that picture, in which case we’re not talking about lines and curves and where they are tangent — we have to start imagining multi-dimensional surfaces with potentially oddly twisted shapes. It becomes less obvious that there is one point in that multi-dimensional space that represents a single portfolio that is optimal for every investor. An MPT proponent might point out that institutions like pension funds do not necessarily share the loss aversion that individuals have, because such institutions have an essentially infinite investment horizon. But even if that is true, it would still be the case that there would not be a single portfolio that would be optimal for both institutional and individual investors, in which case there would still be no logical reason to conclude that the market portfolio is an optimal portfolio (for either kind of investor). Up to this point, we have been considering how loss aversion can cause different investors to evaluate the riskiness of a particular investment differently. But behavioral finance has also identified ways in which even one investor can evaluate the same investment differently. Another one of the assumptions that MPT makes is that investors always think of all of their assets together, as one portfolio. In reality, people view their assets as a collection of separate portfolios. (The term for this is “mental accounting.”) What’s more, their risk appetite varies from one portfolio to another, and an investment with a particular risk/return profile that they will happily put in one portfolio will be rejected for inclusion in another. In other words, people do not make investment decisions by examining the impact that the potential investment will have on their overall portfolio, which can lead them to make what MPT would view as sub-optimal decisions. To put this in a real world context, think of the expression “playing with the house’s money,” an expression that people use to denote a gambler who has accumulated some winnings, and is therefore pictured as playing with money that really belongs to the “house” — i.e., the casino. (There is an interesting implication behind this expression; it implies that we all know that the house is going to win eventually, so if you are temporarily ahead, those winnings don’t really belong to you, and the house will reclaim them. But of course, you are always free to get up and leave with the money you have won. It is now your money.) People’s willingness to take risk with “house money” can be significantly higher than their willingness to take risk with money that they think of as their “own” money. In the world of investing, this could mean that someone who made a quick profit by getting in on a hot IPO (initial public offering) or by having a stock that was taken over for a large premium over the existing price might view those profits as “the house’s money,” and might be willing to take more risk for a given level of expected return than they might otherwise. In this example, there are again two possible outcomes, but this time each is equally likely. Investment A will pay either 3% or 7%, for an expected return of 5%. Investment B will pay either 10% or 0%, again with equal probability and again with an expected return of 5%, but with a higher volatility to the range of outcomes. MPT says investors should prefer the first investment, since the second offers the same average return but with higher risk. But an investor playing with “the house’s money” might prefer to focus on the chance to make 10% rather than 7% as the best outcome (she’s probably feeling lucky already), particularly since the worst outcome for Investment B isn’t an actual loss, but just a return of 0%, and hence loss aversion will not come into play. If you were to ask that same investor which choice she would make if she was starting up a portfolio to save for her child’s college education, she might focus more on the fact that with Investment A she is at least guaranteed to make some positive return, and may be more likely to prefer that over B, where she may earn nothing. We have seen that different investors can assess the risk of the same investment differently, thanks to the workings of loss aversion. We have also seen that even the same investor can assess the risk of a given investment differently depending on the context of the investment, due to the phenomenon of mental accounting. Clearly, MPT’s definition of risk is incomplete, which calls into question the theory’s conclusions about the existence of a universally optimal portfolio. But we would suggest that the definition of risk is not MPT’s only potentially weak point. We mentioned earlier that we would come back to the assumption that investors seek to maximize their return for any given level of risk. Surely we can’t be questioning that? Well, we’re not so much questioning it as saying that it, too, is incomplete. It’s not that investors don’t want to maximize their return for any particular level of risk; they do. It’s just that this is not their only objective. Behavioral economics gives us a more nuanced view. Yes, investors would like to maximize their wealth, but they have an additional objective: minimizing regret. Regret is a very powerful emotion, and it plays an important role in our minds; just think about how many songs have been written about regret, and then try to name a single song that has been written about maximizing your investment return. In some ways, the desire to avoid regret is just another manifestation of loss aversion. Earlier, we looked at a hypothetical choice of investments in which one investment had a potential loss of 75%. Part of the aversion to that investment that some investors feel is the knowledge that if they pick that investment and it does go down 75%, they will feel regret at having made that choice, even though that investment had a higher expected return and a supposedly lower level of risk (at least as defined by MPT) compared to the alternate choice. Even if all of these important assumptions that MPT makes about the definition of risk and about investors only seeking to maximize return really are untrue, does it matter? Do these flaws in the theory create opportunities for investors to make what MPT would consider to be excess returns — i.e., to beat the market? And if so, why have active managers seemingly been unable to take advantage of those opportunities? After all, the empirical evidence shows that managers as a group have failed to outperform the market over the long run (at least on an after-fee basis), and there is a frustrating lack of consistency between managers who do well in one period and those who do well in a subsequent period. In seeking to understand why so many active managers have been unable to outperform broad market indices, behavioral economics can again be useful. Another insight from behavioral economics is that investors are overconfident. Indeed, it is a human trait that extends into many fields, not just investing. (Try asking a room full of people for a show of hands on how many think they are above average drivers. You will almost always find that far more than half of the people raise their hands.) When it comes to investing, overconfidence causes many people to think that they know more than they really do. Sometimes this means they think they know something about a company that is not in fact true (e.g., they have a view about where its sales or margins are heading that turns out to be wrong). Other times it means that they know something which is in fact true, but which they (incorrectly) think is not already reflected in the price of the stock. Either way, overconfidence causes many managers to trade on information that is either wrong or is already reflected in the market price, and they incur transaction costs in exchange for no actual prospect of excess return. Second, many managers are tripped up by a lack of sufficient discipline; they don’t stick to a consistent decision-making process. To the extent that behavioral biases create market inefficiencies, managers need to understand how and why those inefficiencies arise. Most importantly, managers need to understand that they too are subject to these same behavioral biases, and must learn to recognize and overcome them in their own thinking. Generally, the best way to do that is to create a process that will guide the manager toward (or away from) stocks with certain characteristics (or sets of characteristics), despite what the manager’s “better judgment” might be saying, and to stick to that process rigorously. Capturing the impact of stock-specific inefficiencies requires a disciplined process that 1) understands the forces that creates an inefficiency, 2) captures it by casting a wide net across stocks that are likely to be affected, and 3) properly structures the portfolio so as to filter out the impact of any factors (e.g., size effects or industry effects) for which the manager currently has no forecast, and which might otherwise swamp the excess return generated by the inefficiency that the manager is trying to capture. We would argue that most active managers fall down at one or more of these steps. If that is true, then the fact that active managers have not generated excess returns as a group does not constitute proof that generating excess return is impossible; rather, it demonstrates that it is simply very difficult, and that most managers have not been following an approach that is likely to work. Up until now we have talked about the arguments against active management. One final thing to consider is a more pragmatic argument against passive management. Critics of passive management sometimes refer to indexing as a “momentum strategy.” The idea is that because an index fund holds stocks in proportion to their market capitalizations, it will always be “overweighted” (though only with the benefit of hindsight) in stocks that have enjoyed a significant run of outperformance, and in retrospect turn out to have reached an overvalued level from which they subsequently underperform. Similarly, it will be “underweighted” in stocks that have underperformed the market to the point that they have become undervalued, and which subsequently outperform. We put the terms overweighted and underweighted in quotes, because of course an index fund is never literally overweighted or underweighted in a stock. The essence of the criticism is more that if markets get overly optimistic or overly pessimistic about a stock and subsequent news causes a reversal in that stock’s fortunes, an index fund forces you to go along for the ride. At the extreme, think of what happened to the weight of the Japanese market within the MSCI EAFE Index in the late 1980s, as Japanese stocks ascended to stratospheric heights of overvaluation. By the time the Japanese market reached its peak at the end of 1989, it was trading at almost 60 times earnings and made up almost 60% of the EAFE Index. If you held an EAFE Index fund, you had your highest weight in Japan just before the market collapsed in 1990. We would not go so far as to characterize indexing as a momentum strategy, because that term implies a certain amount of intentional active decision making to literally overweight stocks that have done well, and that is not what index funds do. But investors in index funds do, in essence, make an “active” decision not to make any attempt to identify overvaluation or undervaluation, and simply go along with whatever the market decides every company is worth at each point in time. There is some irony in pointing this out, simply because any over and undervaluations that do develop are, after all, driven by active investors. So even though passive investors are seeking to get away from active management, they are still allowing their investments to be influenced by active investors. But passive investors are implicitly saying that they think it is impossible to identify over or undervaluation except in retrospect. We would disagree. The “value effect” is probably the most persistent “anomaly” that MPT has been unable to explain, but behavioral finance can provide insight into a host of cognitive biases that cause some stocks to become undervalued and others to become overvalued. (Just to cite one example, “recency bias” causes people to overweight the importance of the most recent data, so investors will shy away too much from companies that have recently reported bad news, and will be too enthusiastic about companies that have recently reported good news.) To repeat what we said in the previous section, it takes a disciplined approach to capture the value effect, because even value investors are subject to the same behavioral biases as everyone else, but it can be done. Modern portfolio theory is an impressive achievement, and it has reshaped for the better the way that people think about investing by focusing on the relationship between risk and return. But like any body of theory, it is based on certain simplifying assumptions. When it comes to defining risk, we believe the assumptions that MPT makes are too simple. We think risk is a far more complex factor than the theory allows, and the work of behavioral economists has demonstrated conclusively that investors do not perceive risk in the way that MPT defines it. As a result, we think MPT’s conclusion that there is one portfolio (the market portfolio) that is optimal for all investors is not true. Each investor needs to understand his or her own perception of risk to determine which investment strategy suits them best. That leaves the door open to pursue actively managed strategies. The empirical evidence does indicate that most active managers have failed to outperform the broad market, but we take the view that this is an indication that many of those managers are not following a disciplined enough investment process. We believe the same cognitive biases that cause people to perceive risk in such a complex way also cause them to undervalue some securities and overvalue others. A disciplined manager, alert to his own biases and careful to correct for them, can still find ways to capture the inefficiencies in the market. But even the most skillful active managers will sometimes underperform. Indeed, just as getting a hit three times for every 10 at-bats makes for a great baseball hitter, one could argue that outperforming 60% of the time makes for a great active manager. But that means even the best managers will underperform 40% of the time. And in some market environments, most active managers can be expected to underperform. The market conditions of the last three years, in which unorthodox monetary policy sent a flood of liquidity into the capital markets, pushing up low-quality stocks faster than high-quality stocks and magnifying the drag from holding cash, created just such an environment. …[S]tudies suggest that investors may be able to identify SAMs [superior active managers] ex ante by considering (1) past performance (properly adjusted), (2) macroeconomic correlations, (3) fund/manager characteristics, and (4) analyses of fund holdings. We suspect that using a combination of these approaches will produce better results than following any one approach exclusively. Active management will always have a place in “mostly efficient” markets. Hence, investors who can identify SAMs should always expect to earn a relative return advantage. Further, this alpha can have a substantial impact on returns with only a modest impact on total portfolio risk. Finding such managers is not easy or simple — it requires going well beyond assessing past returns — but academic studies indicate that it can be done.